The SparkFun MEMS microphone breakout board is a simple and easy-to-use microphone for a variety of sound-sensing projects. The on-board mic is an ADMP401, which is a low-power, omnidirectional microphone with an analog output. It works for both near and long-range uses and is particularly good for portable applications due to its low power consumption. Possible applications include: smartphones, digital video cameras, and keeping an "ear" on your pets while you're away. Read this hook-up guide to get an overview of the breakout board and how to use it, including its technical specifications, how to hook it up to a microcontroller, and an example code to get started! Questions? Feedback? 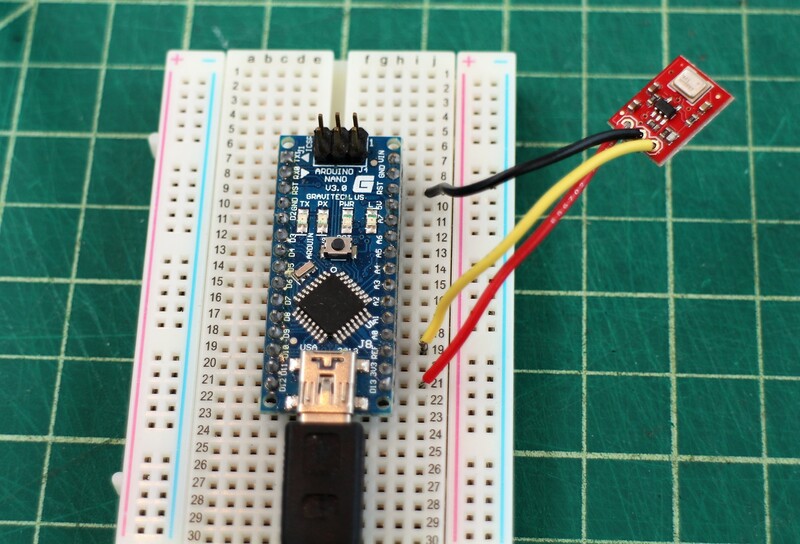 Want to share an awesome project you built using this sensor? Write a comment at the end of this tutorial! 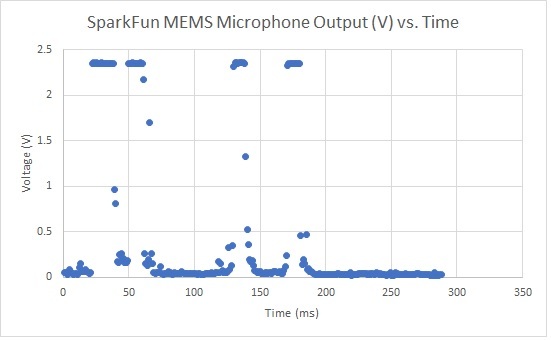 To successfully use the SparkFun MEMS microphone breakout board, you'll need to be familiar with Arduino microcontrollers, analog (aka ADC) input, and sound waves. For folks new to these topics, check out the following resources to get a feel for the concepts and verbiage used throughout this tutorial. Overview of the Arduino microcontroller. What the heck is analog?? Read this! The Wikipedia page on the science of sound! And finally, and most importantly, the ADMP401 datasheet! 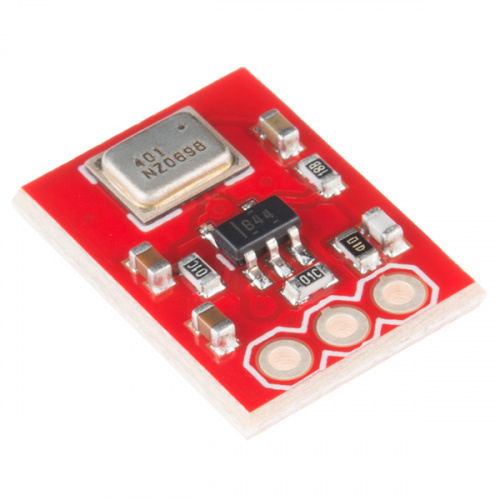 The SparkFun MEMS Microphone breakout board uses the ADMP401 microphone for sound detection. There are three ports for this board: Vcc, the power input (~ 3.3V), GND, or ground, and AUD, the audio signal output. The AUD output is an analog signal. To power this lil' mic, use a DC voltage between **1.5 and 3.3V **with a supply current of about 250 μA. Check out the ADMP401 datasheet for a complete overview of the board. The SparkFun breakout board includes an amplifier with a gain of 67, which is more than sufficient for the ADMP401 mic. The amplifier's AUD output will float at one-half Vcc when there is no sound. When held at arms length and talked into, the amplifier will produce a peak-to-peak output of about 200 mV. Solder wires (or headers) to the three MEMS mic breakout board ports. 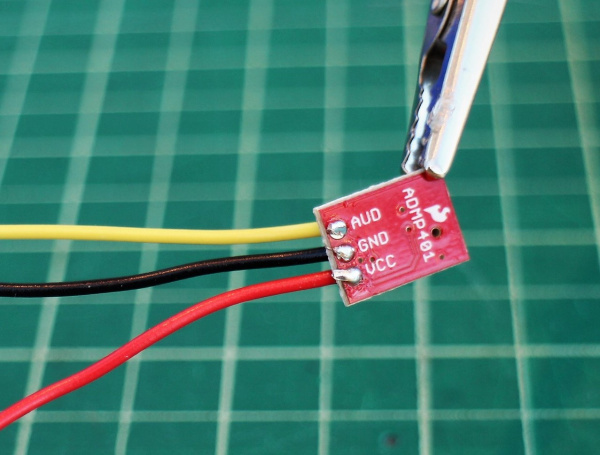 Connect the Vcc port to 3.3V (or anything between 1.5 and 3.3V) and the GND port to ground. Connect the AUD port to an analog (ADC) input on a microcontroller. Solder three wires (or header pins) to the breakout board ports. Recommended to use red for Vcc, black for GND, and yellow (or some other color) for AUD to easily distinguish the board ports. Connect the Vcc port to the 3.3 V output of a microcontroller (or any power supply between 1.5 and 3.3 V). Connect the GND port to GND on the microcontroller. Connect the AUD port to an analog, or ADC, input on the microcontroller. The next section will cover how to read the Audio signal from the Mic to a microcontroller. 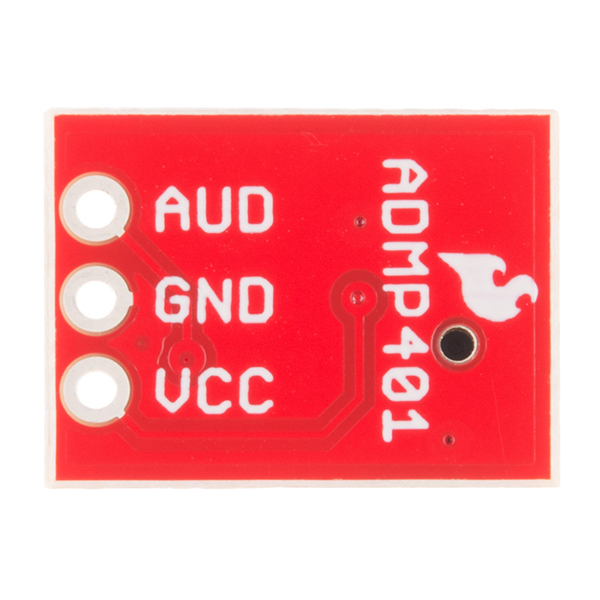 The ADMP401 signal output is a varying voltage. When all is quiet (shhhh), the AUD output will float at one-half the power supply voltage. 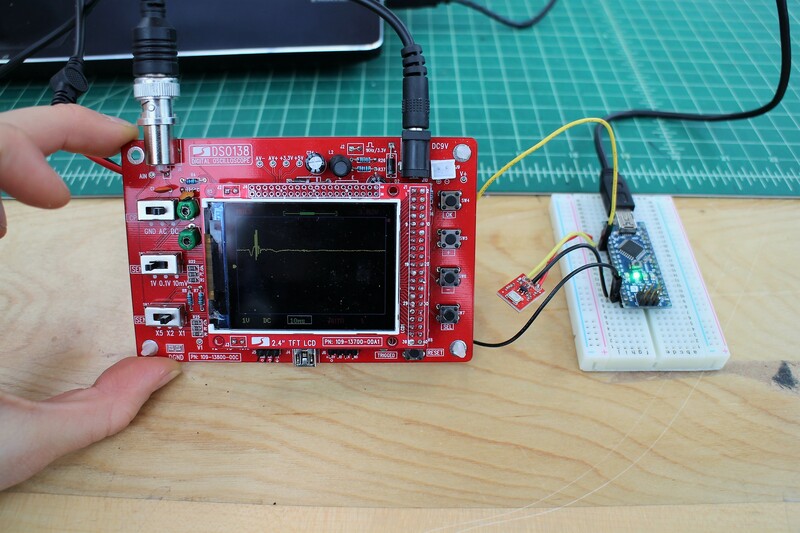 For example, with a 3.3 V power supply, the AUD output will be about 1.65 V. In the photo below, the yellow marker on the left side of the oscilloscope screen marks the zero axis for the voltage (aka V = 0). The pulse is the AUD output of a finger snap close to the mic. In our case, the ADC Resolution is 1024, and the System Voltage 3.3 V. We'll need to add this equation in our code to convert our ADC Reading into a voltage. But Wait, What Are We Actually Measuring?? For many applications that deal with sound (which is a wave), we're mostly interested in the amplitude of the signal. In general, and for the sake of simplicity, a larger amplitude means a louder sound, and a smaller amplitude means a quieter sound (and the sound wave frequency roughly corresponds to pitch). Knowing the amplitude of our audio signal allows us to build a sound visualizer, a volume unit ("VU") meter, set a volume threshold trigger, and other cool and useful projects! To find the audio signal amplitude, take a bunch of measurements in a small time frame (e.g. 50 ms, the lowest frequency a human can hear). Find the minimum and maximum readings in this time frame and subtract the two to get the peak-to-peak amplitude. We can leave it at that, or divide the peak-to-peak amplitude by a factor of two to get the wave amplitude. We can use the ADC integer value, or convert this into voltage as described above. Below is a simple example sketch to get you started with the MEMS microphone breakout board. You can find the code in the GitHub repo as well. The code, written for an Arduino microcontroller, includes a conversion equation from the ADC Reading to voltage, a function to find the audio signal peak-to-peak amplitude, and a simple VU Meter that outputs to the Arduino Serial Monitor. Be sure to read the comments in the code to understand how it works and to adapt it to fit your needs. * Code is open-source, beer/coffee-ware license. //Return the PTP amplitude to use in the soundLevel function. // You can also return the micOut_Volts if you prefer to use the voltage level. // Volume Unit Meter function: map the PTP amplitude to a volume unit between 0 and 10. // Map the mic peak-to-peak amplitude to a volume unit between 0 and 10. // Amplitude is used instead of voltage to give a larger (and more accurate) range for the map function. // This is just one way to do this -- test out different approaches! If you run into trouble getting, or understanding, an audio signal output from the MEMS mic breakout board, try using a multimeter and/or an oscilloscope to measure the voltage output of the signal in quiet and loud settings. If you're still stuck, leave a comment, and we'll help you troubleshoot. Build a music visualizer! Here's a sample sketch for the music visualizer shown in the SparkFun Simple Sketches example. Record sounds and play them back! You'll also need a speaker, an amplifier transistor, and some pushbuttons (and some code.. here's an open-source mbed example). Make a sound-reactive EL Wire costume and replace the Sound Detector with the MEMS Microphone! Check out these other audio related tutorials below.